POETRY REVIEW. Scarp 23 October 1993. Craig Powell, Gary Catalano, Jill Jones and Martin Harrison. 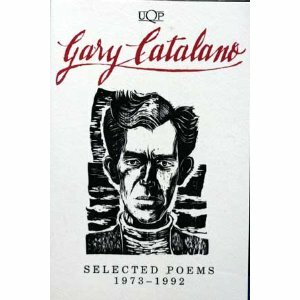 (As these books are out of print I have provide links back to the Australia Poetry Library were the books reviewed are now online). In the closing scene of Alfred Hitchcock’s North by Northwest, Cary Grant and Eva Marie Saint are battling the forces of evil on top of the Mount Rushmore monument. Saint falls and Grant scrambles down to save her. He is holding her with one hand while the other hand grips the cliff top. Just as the bad guy is about to crush Grant’s fingers under his boot, a shot rings out the bad guy falls dead. The camera then zooms onto Grant’s arm as he strains to pull Saint to safety. As the camera tracks back the scene has suddenly changed to the interior of a railway sleeping car. Rather than pulling Saint to safety, Grant is helping her up to the top bunk. Suddenly the scene changes again and we see the last shot of the film which shows an express train plunging into a tunnel. whose mother’s lover fumbled at her at nine? Complementing these short poems in the selection from his from his earliest work is a long poem ‘Remembering the Rural Life’. In this impressive poem Catalano recreates the landscape of his youth, a landscape lost to him both by time and the spread of suburbia. In the Parramatta of the late fifties and early sixties Catalano draws together the threads of his background – his family’s Italian heritage, his adolescent bravado and the growing conflict between a father’s vision of his son’s future and the son’s interest in art and poetry. The strength of the this poem is that it avoids slipping into sentimentality; instead Catalano has utilised an economy of image which is apparent in his shorter poems to create a narrative about memory and growth which effectively sets the tone for much of the other work in the collection. should be pitched at a whisper. While Jill Jones has not yet reached that point in her career which would justify the publication of a volume of selected poems, at her current rate of production she could very soon reach the milestone which Powell and Catalano have just achieved. In fact, the success of her first book, The Mask and the Jagged Star (1992) http://www.poetrylibrary.edu.au/poems-book/the-mask-and-the-jagged-star-0062000 has ensured that her second collection, Flagging Down Time, will attract more than its share of critical attention. she’ll grow the grasslands of dreams. Flagging Down Time should confirm Jones’ reputation as a major new voice in Australian poetry. It will be interesting to see how much longer we have to wait for her third collection. My wife has just seen it – calling it ‘hair on a lens’ and ‘shadow noise’.